Students of Kyokushin International Martial Arts Australia were extremely fortunate to participate in a seminar with Shihan Ken Ogura (8th Dan) for a week in November. 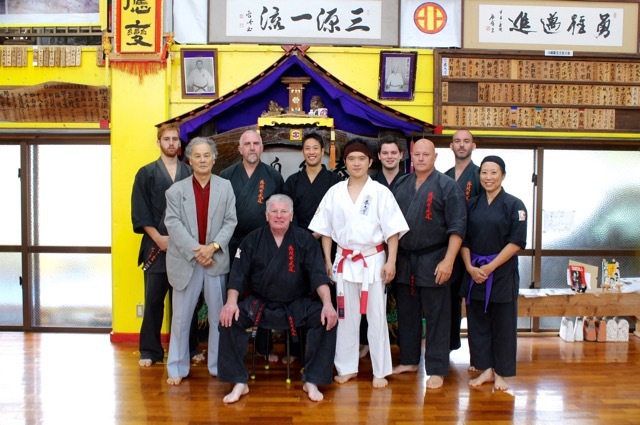 Shihan Howard Lipman and senior KIMAA members met Shihan Ken during the 2015 Japan Group Tour when training at Sensei Hokama’s dojo. The group trained with Shihan Ken for a class and Shihan Ken was most impressed with the “Australian team”. The members of the tour found it to be a fantastic experience, and a friendship was formed between KIMAA and Shihan Ken. Shihan Howard was so impressed with Shihan Ken as an instructor that he invited Shihan Ken to Australia to conduct a seminar in Karate and Kobudo. Shihan Ken was delighted to accept. He arrived in Australia on Wednesday November 16th. 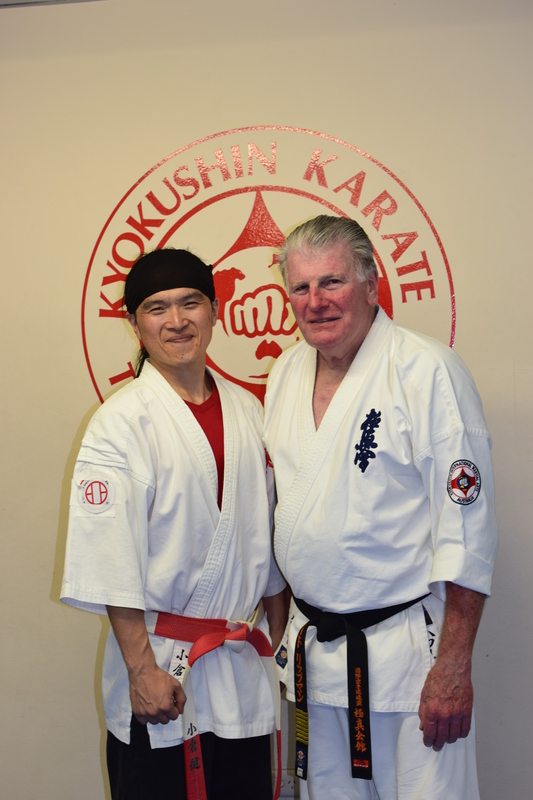 Shihan Howard and his wife Masumi hosted Shihan Ken for the duration of his stay. 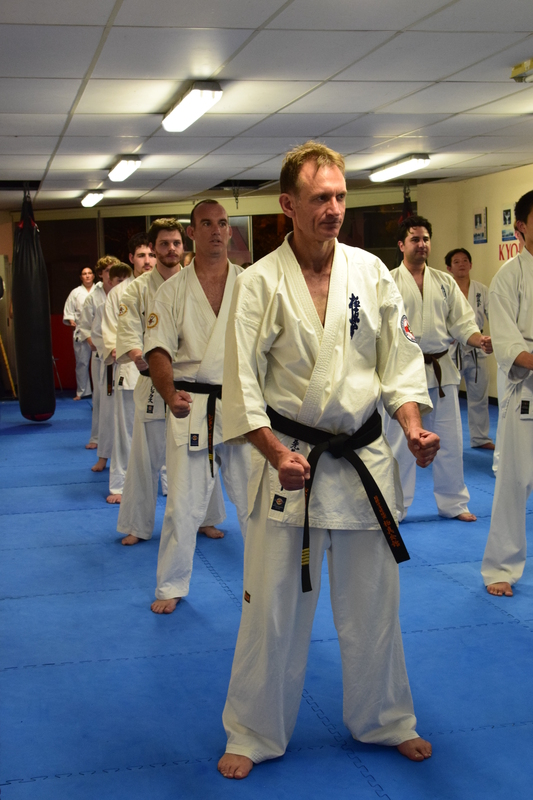 On the Wednesday night, Shihan Ken conducted his first class in the seminar at Turramurra Dojo. Participating were KIMAA members from Turramurra and Annangrove dojos. Sensei Mark McFadden of Lismore Dojo and Sensei Jon Ellis of Ballina Dojo travelled down from the NSW Far North Coast for the week, having seen firsthand the quality instruction offered by Shihan Ken during the last Japan trip. The class ran for two hours and focused on bunkai (self-defence applications) from some Kyu-grade katas, especially the Pinan katas. While KIMAA students regularly study bunkai in weekly classes and seminars, and perform it as part of Kyokushin gradings, Shihan Ken introduced the class to bunkai options from these katas with a Goju-ryu influence, being his main style of Karate. Senior and junior grades alike learned many new applications and enjoyed the training. Sensei Peter Olive quickly became Shihan Ken’s preferred partner to demonstrate applications with, throwing Sensei all over the floor and performing joint locks on him over and over! Sensei James & Sensei Mark. Sensei Jon & Sensei Estan. The Wednesday night class at the Shihan Ken Seminar. There was no class on Thursday, so Shihan Ken was shown the sights of Sydney. Shihan Rick Cunningham, Sensei Mark and Sensei Jon joined Shihan Ken on a climb of Sydney Harbour Bridge. Two classes were held on Friday the 18th. The first was a Black Belt class in the afternoon, which primarily focused on Okinawan Seipai. Joining the mix was Sempai Rob James of North Brisbane and Nundah dojos. That night, Shihan Ken took another class open to all grades. The class was even larger than Wednesday’s, with kyu grades from Lismore and Ballina also in attendance. Once again bunkai was studied, applying joint locks, neck grabs, takedowns and more within the context of kata. After training, the group booked out the restaurant Noodle City in Gordon and enjoyed a meal with Shihan Ken. Training began promptly at 9.00 am the following morning at Annangrove Dojo, with Shihan Rick taking the class through basics and sanbon kumite. After the half hour of warm-up training, Shihan Ken arrived with Shihan Howard to get stuck into the day of learning. A group session revised content from Wednesday and Friday nights, as well as diving into new bunkai from other kata. Lauren from Ballina Dojo works with Sempai James Campbell from Turramurra Dojo. 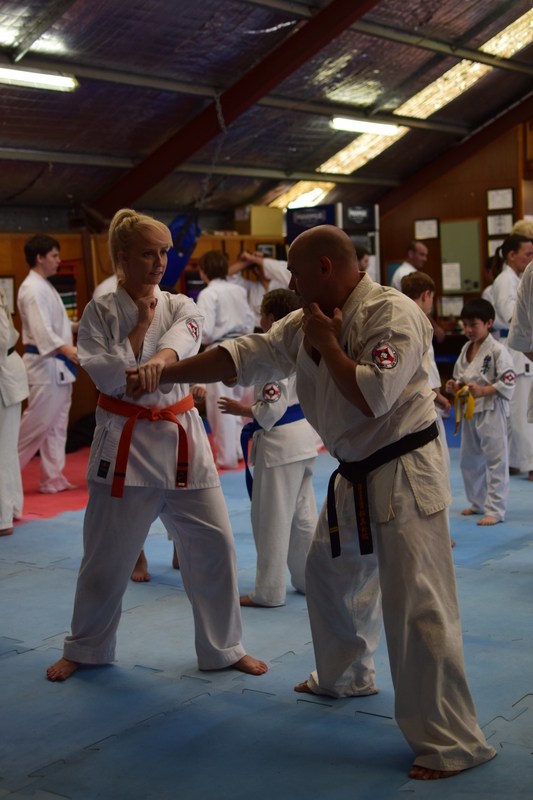 Sempai Rob (Queensland) & Lauren (Ballina Dojo) work together on new bunkai. Following an extended group session, the focus turned to Kobudo (weapons). Sensei Paul Finnerty and Sensei Mark Shelmerdine took groups of students with varying level of Kobudo experience outside to practise the Bo, while the more experienced karateka remained inside to work with Shihan Ken. Shihan Ken checked some basic Bo work with various exercises, the Kihon kata and Ufugusuku, all with the related partner work. Shihan Ken then gave attention to the intermediate Kobudo group, revising the Bo exercises and first kata. Sempai James Campbell and Sempai Alex Lloyd took the senior group through a new exercise Shihan Ken had shown them, before Sempai Alex took over the intermediate group revising Ufugusuku. Tony from Turramurra and Larissa from Ballina work the Bo staff. A BBQ lunch was enjoyed, prepared by Shihan Rick’s wife Kirsti and cooked by Sensei Ian Holdaway. After lunch, the kyu grades practised what they had learned already during the seminar with Sensei Peter. The black belts had the first session with Shihan Ken, where Sensei James Sidwell and Sensei Jon took turns being Shihan Ken’s new demonstration partner, giving Sensei Peter some reprieve. The black belts then went outside to further practise the two Seipai katas. Sempai James Campbell & Sempai Rob James. After a short break, students were again divided into groups. The intermediate kyu grades continued their kata training with Sensei Ben Ng and Sensei Don Cheong, while the juniors remained with Shihan Ken indoors. The black belts revised some Nidan- and Sandan-level katas, led by Sensei Paul and Sensei Idir Bahamid. The black belts then went back inside and Sempai Alex helped the juniors with Sanchin kata. Shihan Howard Lipman awards Shihan Peter Olive his 5th Dan in Kyokushin. The students all came back together for a fitness session with Shihan Rick. Shihan Ken enjoyed watching the Kyokushin students train in their element, taking many photos. He was very impressed. At the end of class, Shihan Howard made an important announcement. Peter Olive began training in Kyokushin at the Honbu Dojo in Tokyo, grading to blue belt before returning to Australia. 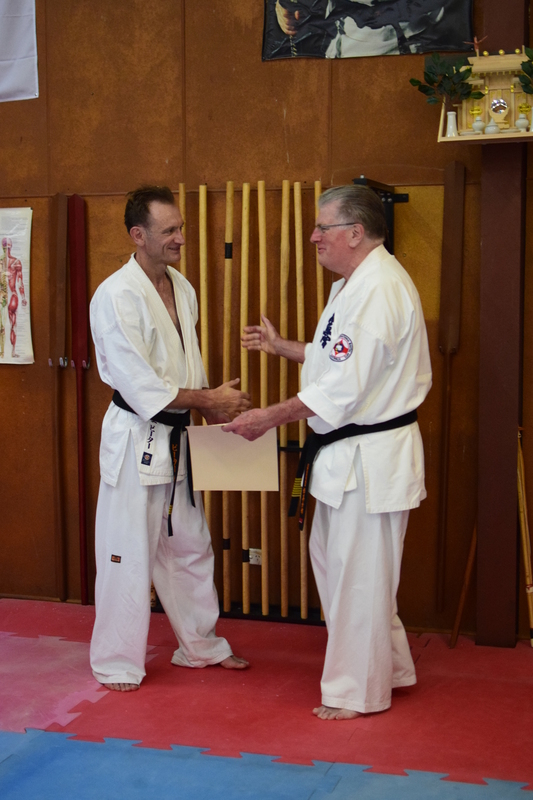 Peter has trained with Shihan Howard, Shihan Rick and KIMAA as a whole for nearly twenty years, and is a regular instructor at both Turramurra and Annangrove dojos. It was Shihan Howard’s pleasure to promote Peter to 5th Dan (Godan) in Kyokushin, and awarding him the title of “Shihan”. After this promotion, Shihan Ken kindly posed with the students for individual and group photos. An enjoyable and relaxing dinner was held for the senior grades and visitors from the North Coast and Queensland at Shihan Rick’s home. Class began at 9.00 am on the Sunday morning, kicking off with more basics and fitness with Shihan Rick and Shihan Peter. Shihan Howard, his wife Masumi and Shihan Ken then arrived to begin training. Masumi took some photos for Shihan Ken and assisted throughout the day. Shihan Ken continued to demonstrate his intricate knowledge of kata and the self-defence techniques hidden within, giving students a much more advanced and deeper understanding of what they so regularly do in class. After the combined training, the juniors stayed inside with Shihan Ken to learn more kata and bunkai. 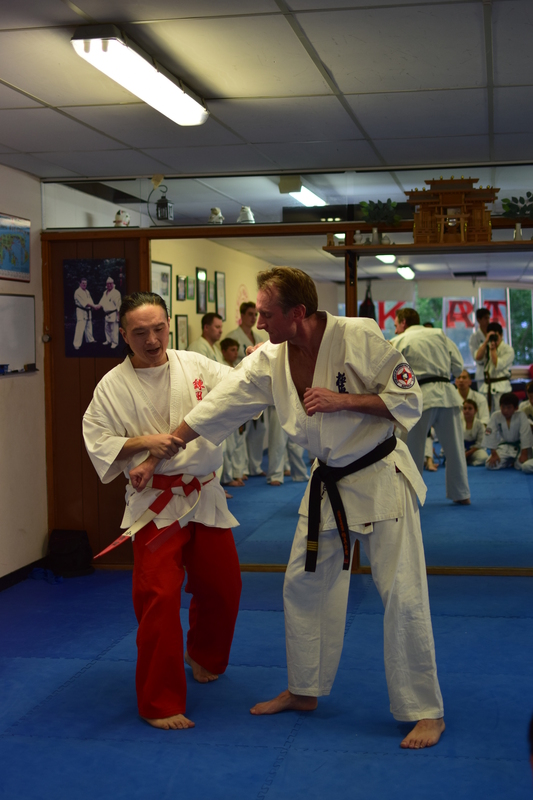 Shihan Peter took Sempai Rob, the Shodans and brown belts through every kata up to Nidan grade level in preparation for the upcoming black belt grading. Sensei Paul meanwhile took the senior black belts through Kanku-Dai. Everyone then came together for lunch, cooked again by Sensei Ian. After the break, the senior Kobudo grades stayed with Shihan Ken for more weapons training. The youngest of the kids went home and the other kyu grades went outside for more kata and bunkai training. Indoors, Shihan Ken ran students through Bo v Bo defence applications. This was followed by the Tonfa kata and Bo v Tonfa defence. Finally, Chibana no Sai and Hame Higa no Sai were practised and polished. Shihan Ken was most impressed with the standard displayed by KIMAA’s senior Kobudo students. The groups continued to rotate indoors and outdoors. Everyone came together at the end of the day for kumite, the fight training important preparation for the senior grading in two weeks time. Shihan Howard and Shihan Rick ended the class by expressing their immense thanks to Shihan Ken for all the training. Shihan Ken was then presented with “traditional Australian bush clothing”! The final session of the seminar was the Monday night. Students arrived quite stiff, needing a lot of stretching to loosen up for the last session! There was quite a split in grades, from senior black belts to outright beginners, so Shihan Ken taught the class in two main alternating groups of seniors and juniors, switching between kata bunkai to basic self-defence. Shihan Ken with Shihan Howard on Monday 21 November 2016. Everybody who attended the seminar, whether for one class or the whole week, walked away amazed at the amount of knowledge imparted to them. Shihan Ken’s time was generous and teaching outstanding, his deep understanding of the martial arts coupled with quality and caring instruction. The senior KIMAA instructors have taken on board a lot of new bunkai and other techniques to practise with their students; Kobudo practitioners have had their skills fine-tuned; and all kyu grades discovered new layers to the martial arts which they may not have realised was there before. The KIMAA karateka are all grateful for their time with Shihan Ken. Especially gratifying for KIMAA was Shihan Ken’s enthusiasm for the Australian students, and his pride in what they accomplished during the week. Shihan Peter and the class line up at the end of training. It was a great honour to train with a brilliant martial artist. Thank you Shihan Ken. Thanks also go to Shihan Howard and Shihan Rick to organising the seminar; Masumi for all her help; to Sensei Ian and Kirsti for feeding the troops; Sensei Mark and Sensei Jon for coming down the coast for the whole week; everyone who travelled from the North Coast; Sempai Alex and Jonathan Lee for the photography; and to all who attended for being exemplary KIMAA ambassadors and training so hard. Shihan Howard addresses the class. Shihan Ken thanks the KIMAA students. Masumi Lipman, Shihan Ken & Shihan Howard. Video footage from the week will be made available to KIMAA senior instructors shortly, filmed by Sensei Mark McFadden and Sempai Alex. Senior KIMAA black belts will next see Shihan Ken in the 2017 Japan Group Tour in January. Shihan Howard invited Shihan Ken to return to Australia and conduct another KIMAA seminar in October 2017, and Shihan Ken was quick to accept. We look forward to training with Shihan Ken again next year.